The Car GuideAuto ShowsLos Angeles2019 Toyota Prius: Now with All-wheel Drive! Toyota’s hybrid sedan gets a few improvements for the 2019 model year, but the big news announced at the Los Angeles Auto Show is the addition of an optional all-wheel drivetrain. Likely sensing that plenty of hybrid-powered competitors are being added to the market, such as the Hyundai Ioniq, the Kia Niro and the Honda Insight, the Japanese automaker has decided to give the Prius the advantage of all-wheel drive, which should prove popular in the northern part of the United States and, obviously, in Canada. This drivetrain isn’t actually new, as it’s been available in Japan for some time now. 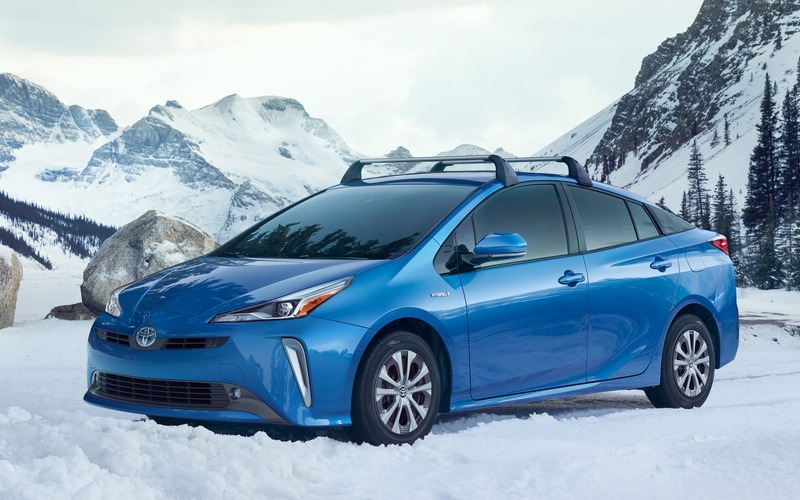 The 2019 Toyota Prius AWD-e boasts an on-demand system that relies on an additional electric motor on the rear axle that powers the rear wheels from 0 to 10 km/h, and then at speeds at up to 70 km/h as needed. In other words, the sedan gets all-wheel traction at launch from a standstill and then at moderate speeds if wheel slippage is detected, but not at highway speeds. The AWD Prius is equipped with a nickel-metal hydride (Ni-MH) battery pack, while the front-drive version gets a lithium-ion battery. Both are stuffed under the rear seat, and cargo space is said to be unchanged despite the additional mechanical hardware: 697 litres with the rear seats up, 1855 litres with the seatbacks folded down. This simple setup allows the Prius to preserve its high fuel economy ratings. In fact, Toyota Canada projects the AWD-e version’s city/highway/combined numbers at 4.5/4.9/4.7 L/100 km. In comparison, the front-drive Prius should boast ratings of 4.4/4.6/4.4 L/100 km. The company expects that up to 65% of Prius buyers in Canada will spring for the all-wheel drivetrain. The 2019 Toyota Prius also benefits from revised front and rear fascia, with two new paint colours, Supersonic Red and Electric Storm Blue. 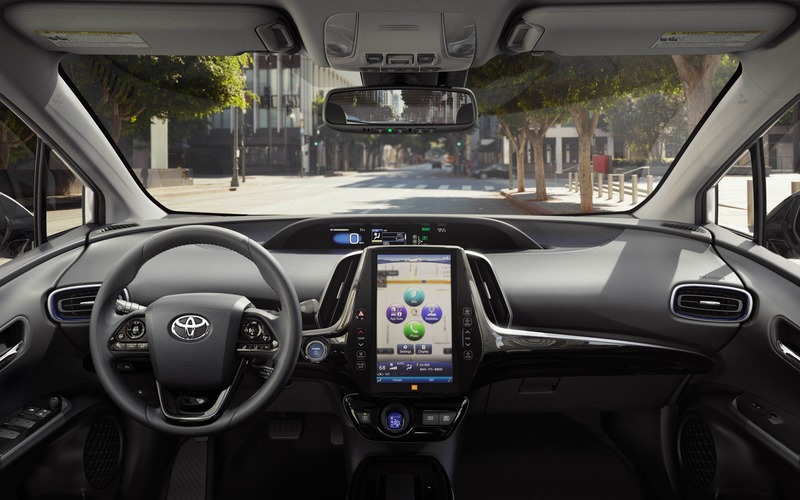 Both variants of the Prius will be offered in base and Technology trim levels, while the Technology with Advanced package trim is reserved for the Prius AWD-e. A heated steering wheel is now included in the Technology grades, and the Prius AWD-e Technology also features an eight-way power driver’s seat and SofTex (simulated leather in Toyota-speak) seat upholstery. The Technology with Advanced package grade adopts the Toyota Prius Prime’s 11.6-inch infotainment system display. The Prius’s hybrid system still consists of an Atkinson-cycle, 1.8-litre four-cylinder engine, an electric motor and an electronically controlled automatic transmission, for a total output of 121 horsepower. No word on pricing yet, but the 2019 Toyota Prius will go on sale in the spring of 2019.